Has your friend been acting a little odd? It might be a bad sign if he’s saying strange things, has unexplained wounds, and has been levitating a lot lately. You might need to perform an exorcism on his behalf. After all, he would do it for you. Here’s your chance to expel that demon who has possessed your buddy—and look official while you’re doing it. You want your friend back, don’t you? He’s probably looking at you as his only hope now. Or, is the entity just making faces at you? 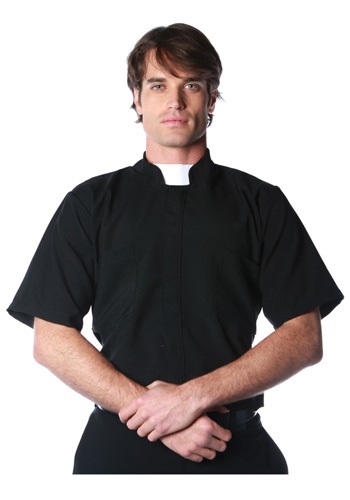 Either way, make sure to slip into your Priest Shirt before performing the ritual. The spirit will take you more seriously that way. Whatever you do, don’t forget your holy water and crucifix, and make sure to have the whole ritual down before you start...preparation is everything. Once your friend is free, don’t be surprised if you’re contacted for your exorcist services. You might just have a new career on your hands!